Z WORLD, represented by Dominion Electronics , has released the RCM3300 microprocessor core module. 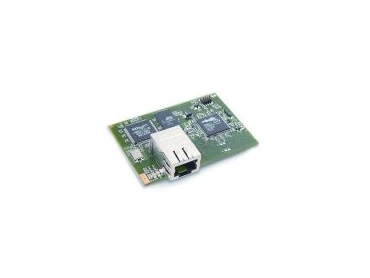 It supports a software bundle composed of three modules developed to enable rapid web browser development, provide a secure socket layer for Ethernet data transfer, and manage onboard serial Flash data. The RabbitWeb module is a HTTP/HTML web development extension that can read and write program variables remotely while eliminating complex CGI programming. It also creates controls such as pull-down menus or control buttons on a Web interface while ensuring valid input values and proper user authorisation. RabbitWeb indicates input errors for easy correction and yields a 10x reduction in CGI programming and debugging time. The file allocation table (FAT) file system module enables a ready to run, serial Flash-based file system. It works with the Dynamic C HTTP server to reliably update contact to the FAT such as databases and web pages. This module also supports a battery backed, wear reducing cage system to protect the file system during power loss. The secure socket layer module provides HTTPS security for 8-bit embedded devices using the Rabbit 3000 microprocessor. Fast processing of complex encryption algorithms (up to 120Kbits/sec) supports HTTPS with SSL version 3 and Transport Layer Security version 1. The RCM300 is derived from industrial client feedback and combines traditional RabbitCore product strengths into one device. It has a Rabbit 3000 at 44MHz clock, 10/100 Base-T Ethernet connectivity, 4MB or 8MB Serial Flash, 512K Flash, 512K program execution, and 512K data SRAM. 498 digital I/O shared with the five serial ports operate at 3.3V, with 5V-tolerant I/O.